A British woman who woke up with a Chinese accent after suffering a stroke is devastated - after being told the side effect is permanent. Sarah Colwill's strong Devon drawl disappeared overnight, in one of only 20 known cases of Foreign Accent Syndrome worldwide. Medical staff say they have exhausted all options and, despite Sarah never visiting China, she has to accept her Far East voice is here to stay. Sarah, 40, says her life has been made a living hell and she has lost her home, her job and her previous life as a result of her bizarre condition.Experts say it is caused by a 'drawing out' or 'clipping' of the vowels that mimics an accent even though the patient has limited exposure to that country. It was first identified during the Second World War when a Norwegian woman was hit by shrapnel during an air raid.She suffered brain damage and developed a strong German accent, which led to her being ostracised by her community in 1941. The night that changed her life came after ten years of suffering from severe head pain, which caused stroke-like symptoms.She then woke up after a series of attacks sounding like she was from China.Sarah says she is trying to remain positive, but since first developing the condition five years ago her life has been turned upside down. Aside from her accent, Sarah suffers with a multitude of health problems and struggles through every day. She had to leave her job as an IT project coordinator and is in the process of selling her home as she could not afford to pay the mortgage. 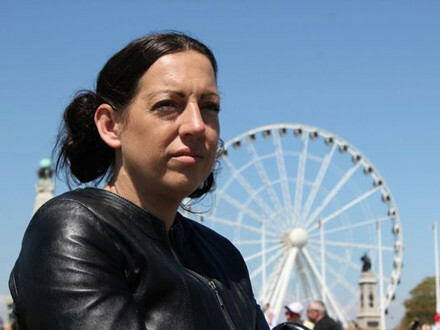 In 2013 the BBC aired a documentary on Sarah's experiences called 'The Woman Who Woke Up Chinese' to try and get more help.It was hoped the documentary would bring forward other sufferers or specialists in the field who might be able to help.But two years on and Sarah says they've "exhausted" all treatment plans and are as clueless as they were. At the moment Sarah needs seven hours a week personal care and her brain finds it difficult to cope with temperature changes, so going shopping or washing is very difficult. Waking up with a Chinese accent.....how awful!!! yeah, why not an unintelligible cockney accent instead?